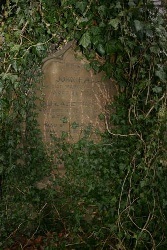 Ivy can very quickly make a grave monument completely illegible by smothering it with growth. Often this growth can be removed without damage to the underlying stone. However if the monument is made of a soft stone then the roots of the ivy may penetrate it and then eventually remove the top legible layer. Ivy damage is most often a problem in neglected rural churchyards. Example of ivy damage. In this example much of the ivy has been removed from the main part of the monument. Although the damage to this monument is not great it clearly shows how the roots do begin to penetrate the soft stone. These small holes then make the danger of frost damage more likely.